The massive Iron Hindenburg in Berlin, its decorative scaffolding and cannons. One method to raise war funds was through nailings, charging for adding a nail to a wooden iron cross, statue or other object. 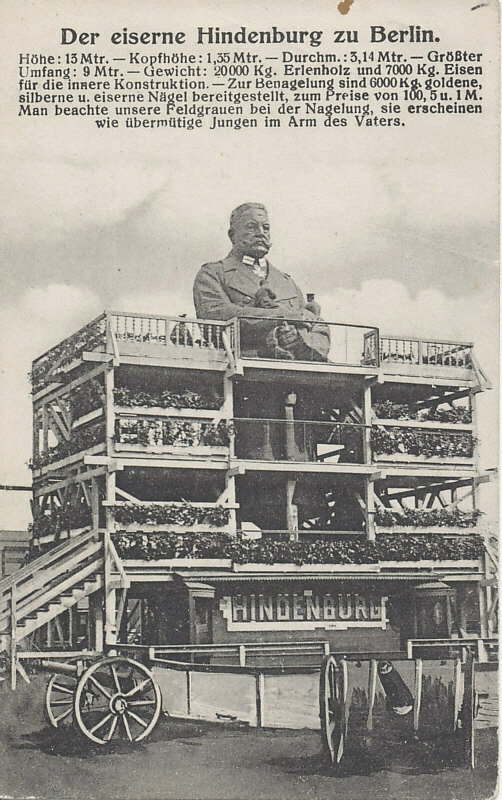 Berlin was the site of this massive statue of General Paul von Hindenburg, hero of the Battle of Tannenberg. One could nail an iron, silver, or gold nail for 1, 5, or 100 marks respectively. Höhe: 13 Mtr. - Kopfhöhe: 1,35 Mtr. - Durchm. : 3,14 Mtr. - Größter Umfang: 9 Mtr. - Gewicht: 20000 Kg. Erlenholz und 7000 Kg. Eisen für die innere Konstruktion. - Zur Benagelung sind 6000 Kg. goldene, silberne u. eiserne Nägel bereitgestellt, zum Preise von 100, 5 u. 1 M. Man beachte unsere Feldgrauen bei der Nagelung, sie erscheinen wie übermütige Jungen im Arm des Vaters. Height: 13 meters - Head Height: 1.35 meters - Dia. 3.14 meters - Greatest Extent: 9 meters - Weight: 20,000 Kg., 7,000 Kg. alder wood and iron for the inner construction. - 6,000 Kg. of gold, silver and iron nails are available for nailing, at the price of 100, 5 and 1 Mark. 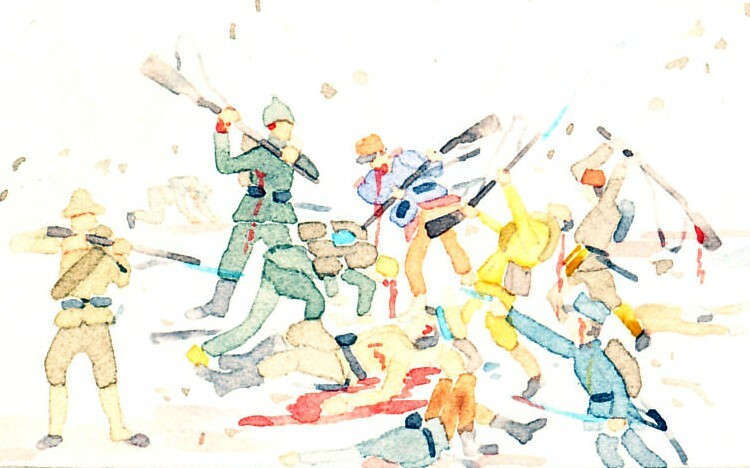 Note our troops in field gray who are nailing; they seem like wanton boys in their father's arm. 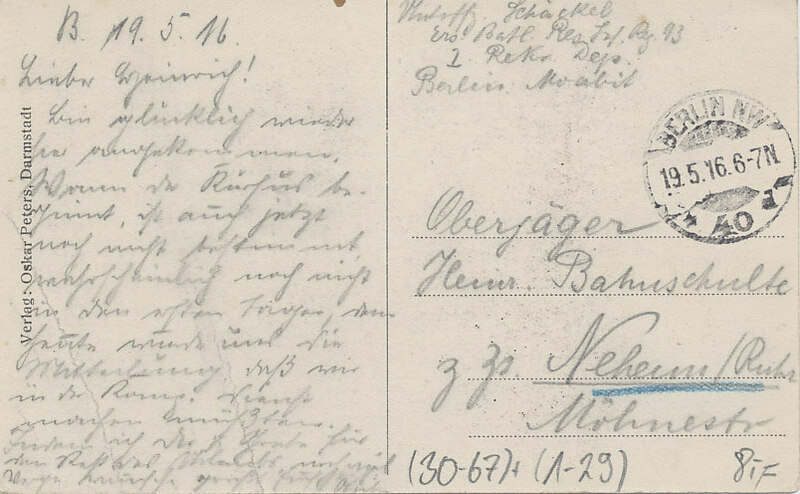 Dated and postmarked May 19, 1916 from Berlin. German Chief of the General Staff von Moltke appointed General Erich Ludendorff to halt the initial Russian advances into East Prussia in August 1914. Because he was relatively junior, Moltke brought General Paul von Hindenburg out of retirement and designated Ludendorff his chief of staff. 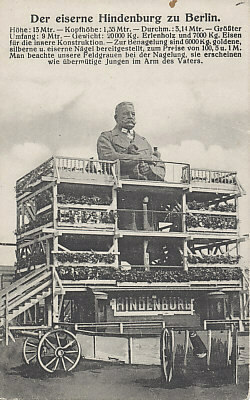 Although the outgoing general's chief of staff had developed the strategy the led to the German victory in the Battle of Tannenberg, von Hindenburg was credited with the triumph and with destroying the Russian Second Army. After the defeat at the Marne, Kaiser Wilhelm replaced Moltke with Falkenhayn. With the failure of the Race to the Sea to defeat France, Falkenhayn concluded that neither side could overcome the other's defensive line in the west. In command on the Eastern Front, Hindenburg and Ludendorff launched offensives to defeat Russia, offensives Falkenhayn thought meaningless despite sometimes enormous advances Hindenburg made. Hindenburg struggled to get more troops on the Eastern Front for more advances, sometimes appealing directly to the Kaiser, who gave him command of the Eastern Front. In the 1915 Gorlice-Tarnow Offensive, German forces advanced up to 300 miles into Russia. After Falkenhayn's defeat in the seige of Verdun, von Hindenburg replaced him as Chief of the General Staff. In 1917, Germany attempted to starve Britain through unrestricted submarine warfare while defending in the west. After the construction of the Siegfried Line (the Hindenburg Line) and the strategic retreat of 1917, Germany had shortened and strengthened its lines. Submarine warfare, however, brought the United States into the war. Germany's last attempts to win the war in its offensives of 1918 nearly broke its army, and led to revolution at home.